Welcome to the New Zealand College of Midwives Canterbury/West Coast region website. Our region supports hundreds of NZCOM members who are midwives, students, educators, consumers, and supporters. We aim to provide information, support, education and a community network. 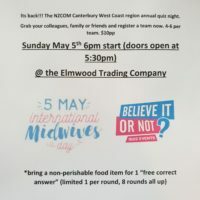 International Midwives Day – Annual Quiz Night! Office bearers our voted in at the Annual General Meeting held in August. Our committees our made up of volunteers who are passionate and work hard to contribute to the region. If you are interested in joining any of the following committees you can email them directly to find out more! We are proud of the hard work and achievements of our committees and are always open to fresh ideas and energy! This tab is designed to have all the information you need about the CDHB and WCDHB in one place and easy to find. This includes how to get an access agreement, who's who of staff and links to the latest guidelines and referral forms. Our tertiary centre provides support with education, obstetric consults and guidelines. As a region we are lucky to have a number of amazing birthing units! However to continue flourishing they need our support. These birthing units are staffed by great midwives who support primary birthing. They are happy to welcome you and show you around and will also be able to provide a second opinion or support if needed when you are supporting someone in labour. Some also have antenatal clinics you can use and run education sessions. 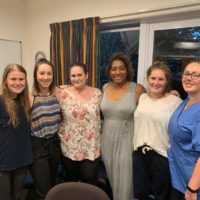 The Canterbury and West Coast region has amazing community organizations that are supported by the region and help support women and midwives. This a a repository for resources that you might find useful in the form of Links, PDFs and videos. If you have any resources that you know your colleagues would find useful please email the website administrator and we can add them to this library. Do you want to become more involved with the region and your profession. Maybe you want a chance to catch up with colleagues or would like to know what is happening on a national level or politically. Maybe you just have a passion for research, education or organising events. We hold regional meetings on the first Tuesday of every month and all members are welcome or email the Regional Chair or one of our committees directly.